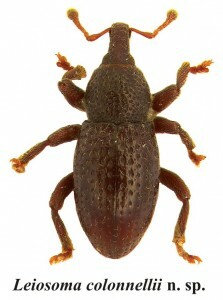 Six new species of Coleoptera Curculionidae described from Italy! Our member Guido Pedroni from Bologna, published on the Bulletin of the Museum of Natural History of Verona (36, 2012 Botanica Zoologia: 73-90) the issue: Le specie italiane del gruppo di Leiosoma scrobiferum con descrizione di sei specie nuove (Coleoptera, Curculionidae, Molytini). In this work the Italian species of Leiosoma Stephens, 1829 close to L. scrobiferum Rottenberg, 1871 are revised. The group scrobiferum is defined, and L. baudii Bedel, 1884 is raised to species level. A neotypus of L. scrobiferum and the lectotypus of L. baudii are selected, and six new species are described from Italy: L. alpinum n. sp. (Monti Lessini, Val Camonica, Monti di Lecco, Valle Po), L. dardagnense n. sp. (alto Appennino Tosco-Emiliano), L. hernicum n. sp. (Monti Ernici, Simbruini, Lepini,), L. fiscellense n. sp. (Gran Sasso e Monti della Laga), L. angelinii n. sp. (Monti Aurunci, La Majella, Parco Nazionale d’Abruzzo, Cilento), L. colonnellii n. sp. (Monte Pollino). A key to the Italian species of the group is provided, as well as remarks about the ecology and host plants of a number of the group L. scrobiferum. The WBA expresses sincere congratulations to Guido Pedroni for his important work which shows that also in a country, like Italy, considered sufficiently known from the naturalistic point of view, it is still possible to discover new species to science. This should be a goad, in particular for young people, to engage themselves in biological investigations in their own country, before engaging in exotic expeditions to far-off lands. Maybe we forgot too early that in Europe Italy is a real biodiversity hot-spot; therefore the work to do is a lot, in particular for zoologists!